CHICAGO — Patients who have a silent form of celiac disease can reverse intestinal damage and feel better overall by taking a preemptive approach, researchers in Finland have found. People diagnosed with the digestive ailment through a blood test benefitted from avoiding grains containing gluten, suggesting this approach could benefit thousands of undiagnosed celiac patients, the scientists reported May 8 at Digestive Disease Week, a scientific meeting. 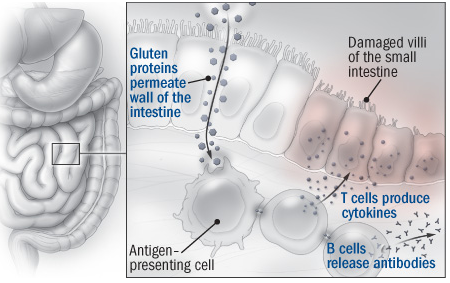 Celiac disease is a lifelong inherited disorder in which the body’s immune system makes antibodies that react to gluten protein in wheat, rye and barley. Three molecular fragments in gluten have been identified as suspected antibody targets (SN: 8/14/10, p. 8). The small intestine suffers from this misguided attack, and celiac patients can experience bloating, diarrhea, constipation, lethargy and poor nutrition as they lose some ability to absorb nutrients through the damaged walls of the small intestine. But many people don’t have such clear symptoms, said gastroenterologist Katri Kaukinen of the University of Tampere. Even undetected the disease can have health effects: It has been linked to poor educational achievement and failure to thrive in children, apparently due to nutrient loss. In adulthood, undetected celiac disease is associated with a risk of fractures, poor dental enamel, short stature, pregnancy difficulties and skin problems. Kaukinen and her colleagues tested 3,031 people who appeared healthy but had a family member with celiac disease, also called sprue. Forty of these people carried antibodies against gluten protein. The scientists randomly assigned half the carriers to go on a gluten-free diet while the others ate what they wanted. After a year, the gluten-free group had signs of better digestion — substantially improved gastrointestinal function and better vitamin levels — and higher quality of life as revealed by a questionnaire of general well-being. Those on a regular diet showed no change. Biopsies taken at the beginning of the study in the 40 people with silent celiac disease showed damage from intestinal inflammation, Kaukinen said. Biopsies done 12 months later showed a substantial improvement in the people on a gluten-free diet, whereas the regular-diet group remained the same or worsened. 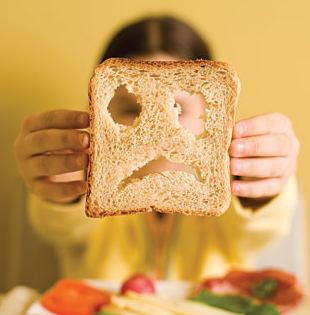 It’s not clear why some people with celiac disease have mild symptoms and others have severe disease. “Some people may adapt to minor symptoms and realize only after treatment that they had had symptoms,” Kaukinen said. Gastroenterologist Joseph Murray of the Mayo Clinic in Rochester, Minn., adds that the novelty of the new study is “the randomization, and that you get benefits” from a gluten-free approach. He says this and other research suggests strongly that family members of celiac patients should be tested for it, as well as anyone with anemia, gastric distress or nonspecific ailments such as chronic fatigue that might stem from undetected nutrient loss. While the prevalence of celiac disease in the overall Western population is about 1 or 2 percent, it’s closer to 10 percent among those with a close relative who has celiac, Kaukinen said. This entry was posted in Culture, Health, News, Science, Website and tagged Celiac Disease, gluten-free, intestine, intestine damage, Science, Science of gluten free, undiagnosed, undiagnosed celiac, Villi on May 12, 2011 by glutenfreepdx.